Also, magic vines can restrict ghosts. Think of ghosts in our world as being like Pokémon ghosts. Physical attacks can’t hit them, but they can be hurt by a variety of other elements. Those vines are clearly magic because they are sparkly. Again, sorry this one was late, but I was sick yesterday so I took a day off from… everything. We had to cover it up because she has a mouth like a sailor. Oh geez, should this go on the Tropes page as an example of Naughty Tentacles? And here I thought you were keeping it PG! These last couple of pages have been particularly good! Oh, and on the topic of adding tropes, would you call Ecta a Cute Ghost Girl? She’s kind of naggy, but she doesn’t seem like a Stringy-Haired Ghost Girl. Hmm, that’s a new trope to me. 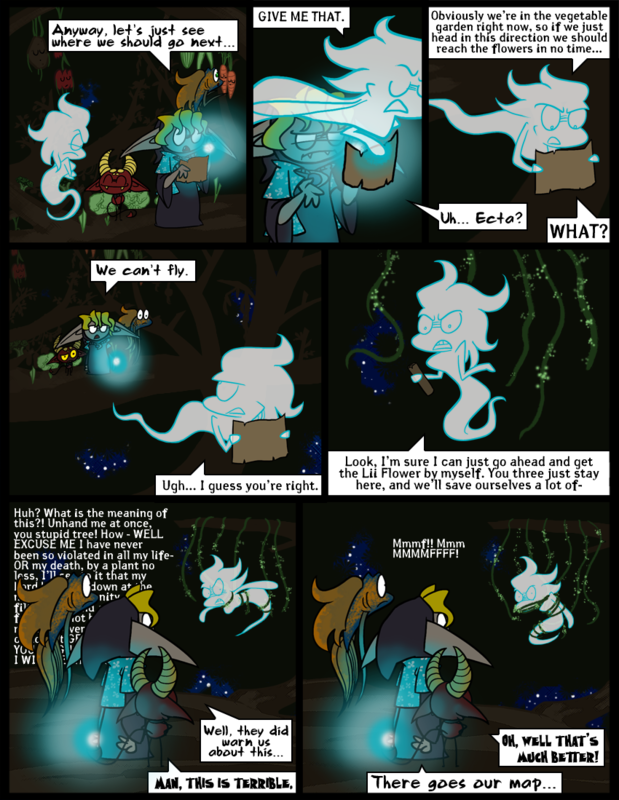 I looked it up, and it fits quite well, minus the whole “looks entirely like a normal person” thing (ghosts in our world blur/fade over time, that is, they lose their pointy extremities, hence why Ecta’s face is kinda blobby and noseless and she doesn’t have fingers… HOWEVER, most older ghosts, like the ones in Castle Skärva, have congealed into a state of looking roughly like Ecta, and there are quite a few of them around, so she could be said to look normal in that regard). Otherwise, I’d say the trope fits, since she’s a key member of the cast whose personality is more important than the fact that she’s a ghost. Indeed, she is so vivacious that some people actually forget she’s already dead: for instance, the leaf guard who tried to stab her. Hey, Victor wrote it XD Can’t anyone just get innocently tangled up in some vines these days? Jeez. To be fair, the fact that these vines are going for a ghost shows they’re not interested in the “naughty” stuff. I see it’s on the page as “Tentacle Rope,” which works. Particularly good, huh? Oh, so you like creepy babies and naughty tentacles? I’ll remember that. Hey, hey! In my defense, in the last page the tree wasn’t so grabby! She’ll be ok, for the most part. She just might never recover from the embarrassment in front of her coworkers. Pokemon! Mention Pokemon, instant comment from me! I’ve been reading, but I’m pretty antisocial so I don’t usually comment. Anyhow, Awesome comic, as always! I must mention Pokémon in all the comments! “naughtiness” is assumed whenever tentacles appear in shows. Siiiggh. Silly Rabid. You would say that. But if Ecta is a ghost, then she should be able to flee from the vines, because you can’t restrict ghost-types from fleeing. Ha! I turned your own Pokemon analogy against you!